Jonesy on the job. Thanks for 23 enjoyable years Ed, not to mention the scores of bad jokes! Circa ’21 photo. My friend Ed Jones is retiring. I guess he’s earned it — he is in his mid-80s. I will still see him with a group of retired fellow broadcasters, the WOC Club, we’re part of when we get together for breakfast on a monthly basis. But I will miss seeing Ed as the lobby host at Circa ’21, where my wife and I are long time subscribers. Following is a news release that Circa put out about a retirement party planned for Ed. For nearly two dozen years, patrons arriving at Rock Island’s Circa ’21 Dinner Playhouse have known that, in addition to dinner and live stage entertainment, they would be treated to one of the venue’s less-heralded treats: a warm greeting, and probably a joke or two, from the theatre’s resident lobby host Ed “Jonesy” Jones. This past December, however, Jones decided to retire from his Circa ’21 position after 23 years of employment – even though, as the theatre’s producer/director Dennis Hitchcock says, he had actually considered doing so several times before. But fans of the ebullient Circa ’21 lobby host will have at least one more chance to see Jones in his longtime Rock Island stomping grounds. 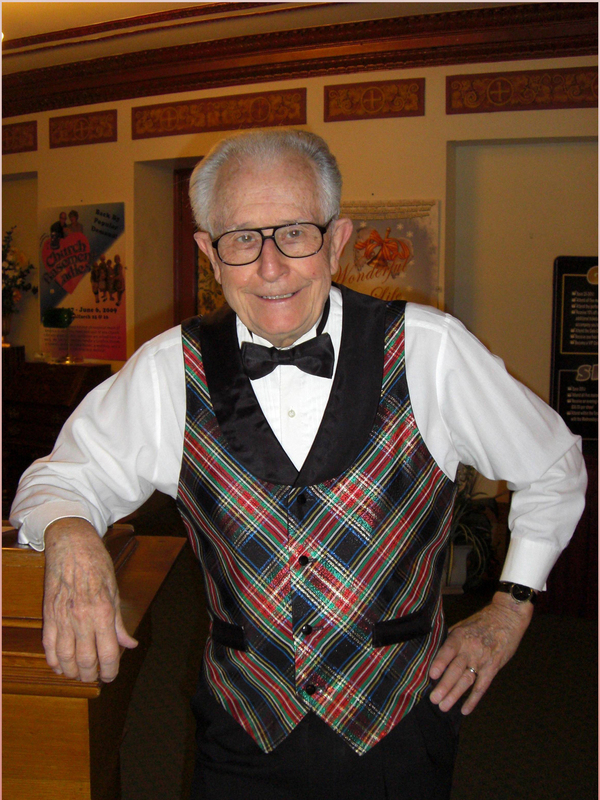 On Tuesday, January 21, the theatre will host a retirement party for Ed Jones from 4 to 6 p.m., with the public invited to share in an afternoon celebrating the almost 24 years of dedicated and always entertaining service provided by this Quad Cities icon. The job, in many ways, was a natural fit for Jones, who grew up in the Boston area and always had a particular fondness for the world of show business. “When I was in grade school,” he says, “I was the only kid in school who tap danced, and who put on dancing shows at lodges and such. And after that, I was the only kid in school who, every Saturday, would be on the train going to Boston to see the latest musical or the latest play – all the shows would try out in Boston before they hit New York. After graduation and two years spent serving in the U.S. Army, Jones did find entertainment-related employment, working at a summer theatre in Vermont and a radio station in Louisiana, and, locally, serving 25 years as a director for Iowa’s first television station, WOC-TV. Jones could also always be counted on to greet Circa ’21 guests with a joke which, depending on the patron, could be anything from G-rated to … not G-rated. Jones, meanwhile, says he misses his Circa ’21 family as well, even though he and his wife Jeannie are greatly enjoying their newfound time together. “She retired, too, just three weeks ago,” says Jones, “and so she’s home all the time, and I’m home all the time, and we’re trying to take little trips and do more stuff together. Ed Jones’ retirement party, open to the public will take place at the Circa ’21 Dinner Playhouse (1828 Third Avenue, Rock Island, IL) on Tuesday, January 21 from 4 to 6 p.m., and more information on Circa ’21 events is available by calling (309)786-7733 extension 2 or visiting Circa21.com. “You are one of the first people in the universe to receive one of these,” said Joe Taylor, president and CEO of the Quad-Cities Convention and Visitors Bureau (QCCVB), the official tourism destination marketing and management organization for the Quad-Cities region. It was Jan. 3, and Joe, without doubt the most enthusiastic cheerleader for the Quad-Cities and vicinity, proudly handed me a hot-off-the-press, full-color, 56-page booklet, the QCCVB’s new Quad-Cities Activity Guide. Joe and I have been friends for a long time. We have a lot in common. For one thing, he has a background in journalism and is superb in his dealings with the media. We also both share an interest in the sport of auto racing. But most importantly we both believe strongly in tourism and that every community in this area — not just the larger ones — benefits when people visit the Quad-Cities and spend their entertainment dollars at tourist attractions, stores, restaurants, gas stations, movie theaters and hotels and motels. Tourism is big business, too: Visitors generated an economic impact of $810 million from more than 1.6 million visitors to the Quad-Cities in 2012. As I thumbed through the new booklet, Joe called attention to its new name. In the past it was known as the Quad-Cities Visitors Guide. Now it’s the Quad-Cities Activity Guide. Joe explained the reason for the change — it’s not just visitors to this area who use this guide — and that makes sense. The guide is used by visitors, residents, group tour planners, meeting/convention planners, sports tournament planners, business recruiters and the media as a resource for information on the Quad-Cities and the things to see and do in the region. The cover and interior page design of the guide also complement the new community brand – Marvels on the Mississippi — the QCCVB introduced last fall. 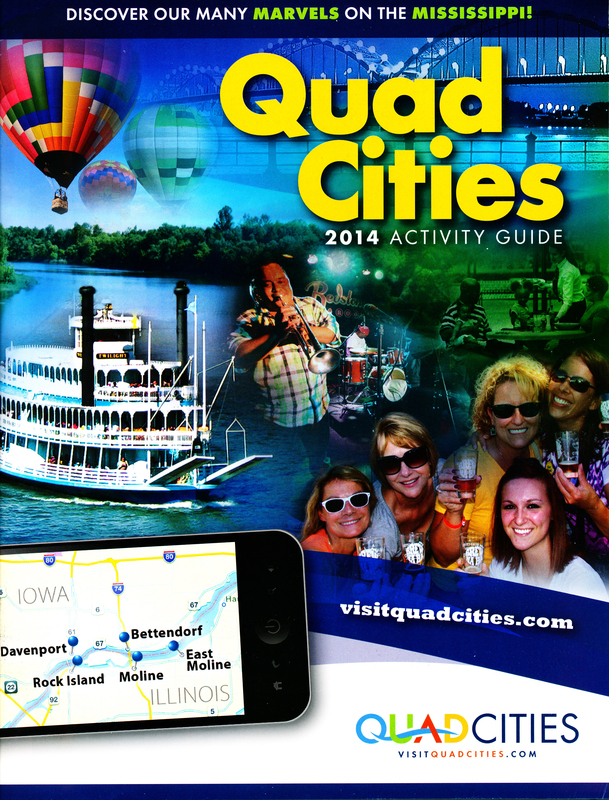 If you’d like a print version of the Quad-Cities Activity Guide, they are available free by ordering from the QCCVB website, visitquadcities.com, by calling the QCCVB at (309) 277-0937 or (800) 747-7800, or by visiting one of the QCCVB visitor centers in the Quad-Cities. An online version of the Activity Guide is available at visitquadcities.com and is mobile accessible. More than 110,000 copies of the guide are distributed annually. Last year’s online version of the guide was viewed almost 10,000 times during 2013. Copyright 2014, by Phil Roberts, Creative Enterprises. This piece was submitted as a column to The North Scott Press, Eldridge, Iowa. Ernie Derr from the funeral home website. A more recent photo from the funeral home website. Bulldog 150 news conference participants. 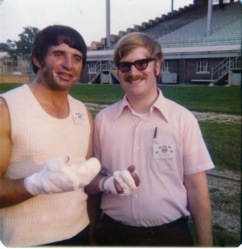 Phil with Ramo Stott, who was recovering from burns. 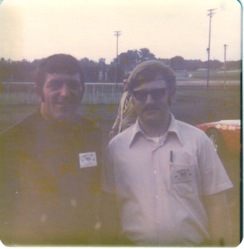 Phil with Davenport driver Terry Ryan. 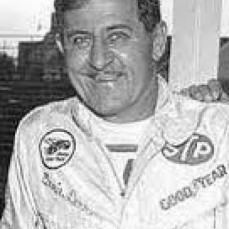 Legendary Keokuk, Iowa, race driver Ernie Derr has died at age 92. Like the World War II veterans, one by one we’re losing all of the old-time race drivers. I first saw Ernie, whose obituary follows, race when I was a teen and he’d occasionally bring his Dodge to Davenport Speedway. Homer Melton was the promoter. I have always suspected Homer paid Ernie to show up to spice up the field of Late Model entries, but I don’t know if that’s true. Ernie did, though, add to the excitement. I met Ernie in about 1974 at a news conference at the Iowa State Fair Speedway in Des Moines regarding an upcoming USAC stock car race (the Bulldog 150, promoted by Jack Housby of Housby Mack trucks) in Des Moines. 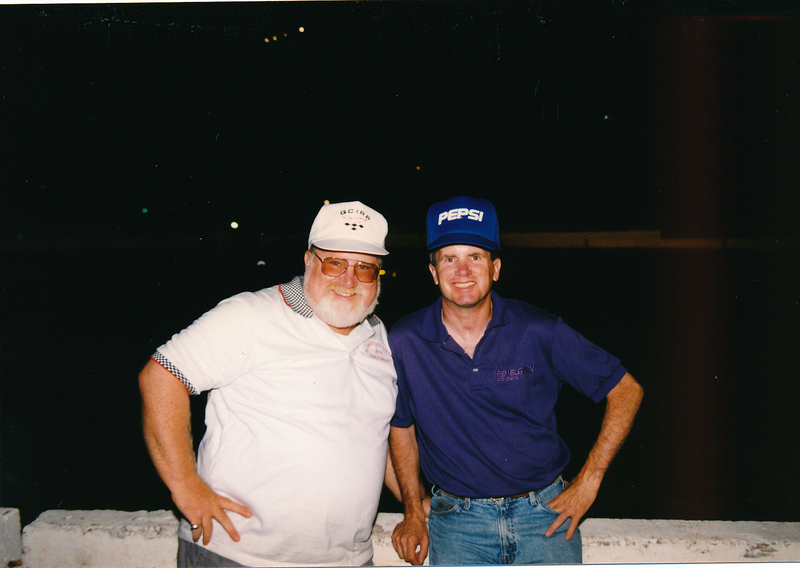 I had a radio program called “Around the Track” and likely recorded an interview with Ernie, who was one of several drivers who attended the news conference. I’ll be looking that up. 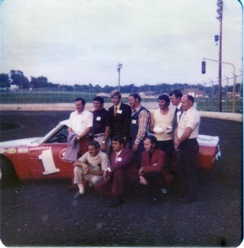 Unlike the others there that day, Ernie brought his race car, a red and white Dodge, number 1. As the news conference concluded, another reporter I climbed into Ernie’s car at his urging for a trip around the track. I foolishly assumed it would be at a slow speed. Another reporter step aside Ernie upfront; I climbed in behind them. That’s when the cockpits of cars were open and not covered with sheet metal. I sent a photo, then went for the ride of my life. The exhaust pipes exited the right side of the car, and the exhaust sound echoed off the concrete wall as he ran just inches from it. “Can you hear the pipes fry?” he asked. “Yes, yes,” we answered, hoping he’d then slow down. He had a big smile on his face, and I know he was enjoying scaring the crap out of both of us. It was a disappointment; I’m sure he had some stories to tell. Comments from two of his sons in an article in the Keokuk paper (http://www.dailygate.com/article_b18791cf-7611-5d76-ac29-dafd3e478015.html) explain Ernie’s attitude. Copyright 2014 by Phil Roberts, Creative Enterprises. Ernest “Ernie” Virgil Derr, 92, of Keokuk died Wednesday, Jan. 8, 2014, at his home in Keokuk. He was born Oct. 29, 1921, near Donnellson, the son of Virgil Emery and Alice Marie Frueh Derr. He is survived by his wife of 67 years, Marianna Lewis Derr of Keokuk; and his children, Nancy Ann (Steve) Smith, James Michael (Barbara) Derr, Steven Wayne (Carolyn) Derr, Russell Lewis (Judith) Derr, Randy Eugene (Nancy Jo) Derr, Danny Joe (Celley) Derr, Karen Garland (Floriday) Derr Anderson, all of Keokuk; 15 grandchildren, Jeff Bennett, Beth Guy, Dannette Sargent, Ashley Haney, Stephanie Ragar, Angie Miller, Bruce, Ryan, Jacob, Alex, Zachary, Austin and Aiden Derr, and David and Douglas Anderson; 11 great-grandchildren, Makenzie, Taylor and Madelyn Guy, Bronson and Irelynd Sargent, Hayden Derr, Charli and Josi Haney, Ava Rae and Lincoln Derr, and Mia Miller; and two siblings, Verna (Don) White and Virginia LeMatty. He was preceded in death by his parents, Virgil and Alice Derr; mother and father-in-law, Isaac Newton and Cora Christy Lewis; maternal grandparents, John and Mary Frueh Derr; paternal grandparents, Screno and Arvilla Allan Derr; his only brother, Guy Derr, who was killed in action in Auchen, Germany, while serving as a private in the U.S. Army during World War II; sister, Mabel Leeper; two brothers-in-law, Harry LeMatty and Raymond Leeper; nieces, Lori Leeper and Gina and Harriet LeMatty; nephews, Rocky, Thad and Thomas LeMatty and Gary White; and great-nephew, Kelly Stenson. From the time Ernie was old enough to work, he helped his father in the farm fields. As he got older, he worked as a farm hand for neighbors for one dollar a day and his dinner. Then as a young man, he got a job working in the Marshall Auto Store in Keokuk. In 1941, he married Urbina Gardner. They had one daughter, Karen. They were later divorced. In 1942, he joined the U.S. Army and served in the European Theater. He was in the 6th Armored Division and drove a weasel and went ahead of his company and laid wire for communications. He earned the rank of corporal and received the bronze star and other commendations. He was proud to have served his country. He was honorably discharged in 1945 and returned home and went back to work at the Marshall Auto Store. He eventually transferred to the Fort Madison store and became the manager for a few years. In 1946, he met and married Marianna Lewis. In 1950, he began his stock car racing career in the I.M.C.A. circuit. 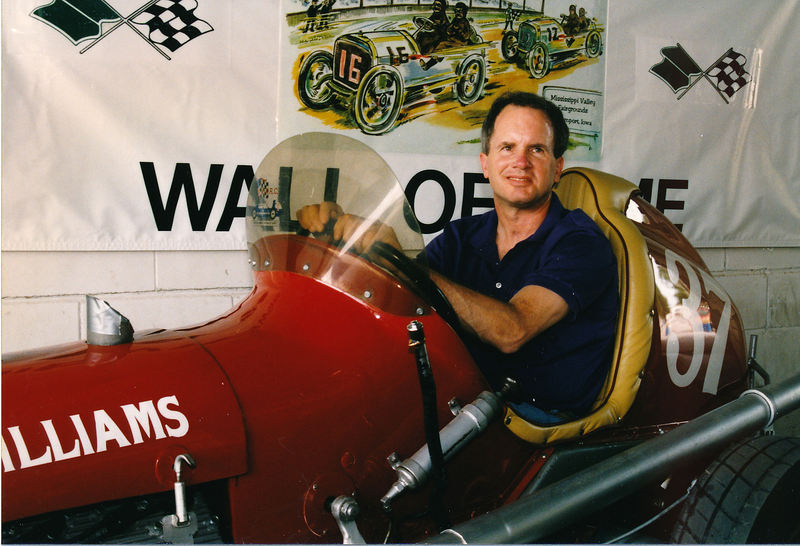 In 1952, he quit working at the Marshall Auto Store, moved back to Keokuk permanently and made racing his life career. He worked many long hard hours to prepare the best race car possible. His dedication and perseverance allowed him to win a great number of races and he was a 12 time I.M.C.A. champion. He raced for 26-plus years and in 21 states, plus Canada. He was honored as a member of several racing sports halls of fame. Visitation will be Sunday and services Monday, with times to be announced. Burial will be in Keokuk National Cemetery. In lieu of flowers, memorials can be made to Wounded Warriors. Note: This piece was written for a track history section on the Davenport (Iowa) Speedway website. Stan Fox (born in 1952 in Janesville, Wisconsin – died in 2000 near Waiouru, New Zealand) was a United States open wheel race car driver. And, as Wikipedia puts it, Fox was one of the last links between the midget car racing world and the Indianapolis 500. 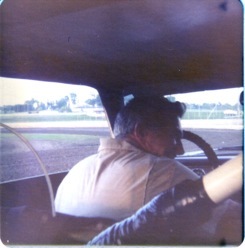 Although Fox never competed at Davenport Speedway, he spent some time at the track. 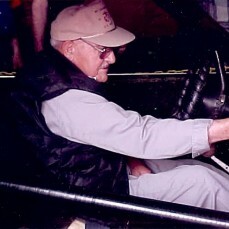 Fox was a guest of the racing history group, Midwest Oldtimers, for the Midwest Oldtime Days racing weekend in September 1996. The accident ended Fox’s racing career but he continued to stay involved with the sport. He started the non-profit organization Friends of the Fox, which supported people with head injuries and brought them to the track each May to meet the drivers and get VIP treatment. Fox never gave up his dream of driving a race car again, but he was not destined to achieve it, either.